As a child, I spent long, happy hours on lazy afternoons searching the clouds for familiar shapes. Puffy whales, fat kittens, and bumpy dinosaurs made frequent appearances. Now, every time I look up, I see big, fluffy slices of Lemon Poppy Seed Cake. Lemon Poppy Seed Cake reminds me of a cloud in every way. It’s delightfully airy, yet has a distinct, lovely shape that is firm enough to stand up to a hot cup of coffee. It’s dreamy with a bright, citrusy flavor that bids my mind to wander to faraway places. It’s also transitional: not rich enough to be a “cake” in the traditional sense, but a little too sweet to be a “bread.” Impervious to this ambiguity, Lemon Poppy Seed Cake drifts nonchalantly between both categories, too confident in its own delectability to be bothered by silly things like baked good definitions. Considering I enjoyed the slice I ate for breakfast as much as I did the one I had for dessert, I’m not worried about it either. This lovely lemon cake (or bread or cloud—take your pick) is delightfully springy in both texture and flavor. The secret to its soft, spongy texture is yeast. I added a packet of Red Star Platinum Instant Yeast to the batter, then left the batter rise in the bundt pan. 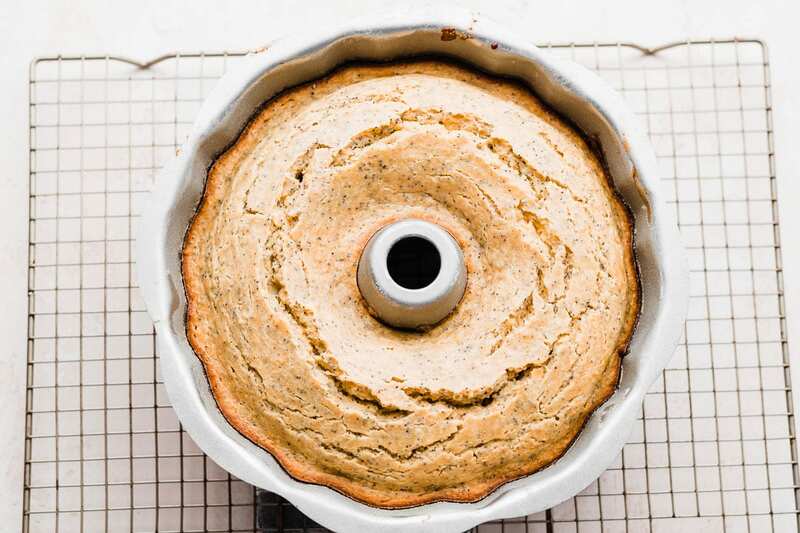 Important note: this batter requires no kneading—the yeast gives the Lemon Poppy Seed Cake a unique texture, but all you’ll need to make it is a basic hand mixer. Simply add the yeast with the rest of the ingredients: plenty of lemon zest, peppy poppy seeds, good vanilla extract, golden butter, Greek yogurt, and whole wheat pastry flour. 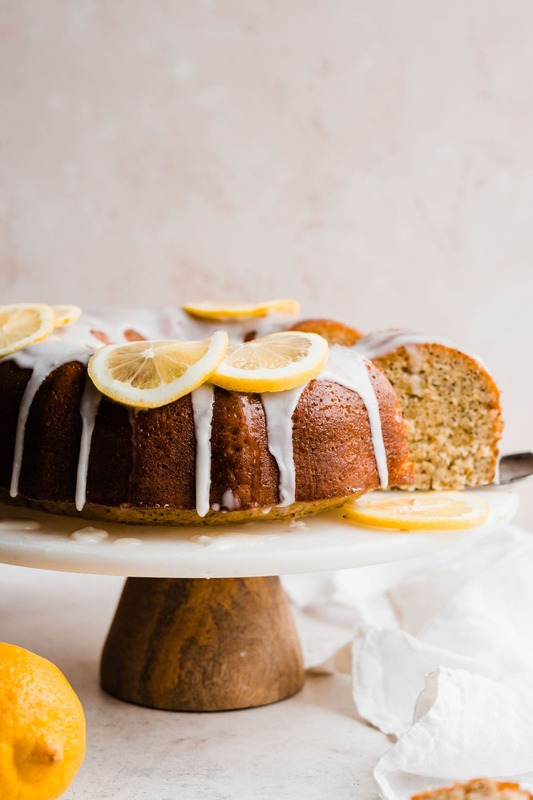 This Lemon Poppy Seed Cake a yogi-master blend of health and decadence. 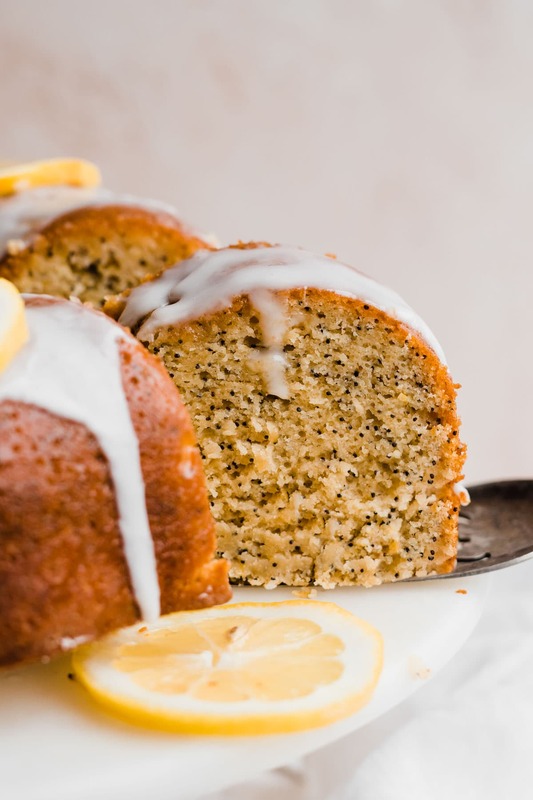 In addition to the yeast, the other essential component to this Lemon Poppy Seed Cake is a lemon soak. Nothing but lemon juice and sugar dissolved together in a saucepan, this simple syrup is imperative to the cake’s supreme moisture and lemony flavor. It trickles into the tiny air pockets created by the yeast, infusing every bite with citrus, and makes the edges extra lemony and addictively fun to pick off and munch with your fingers. 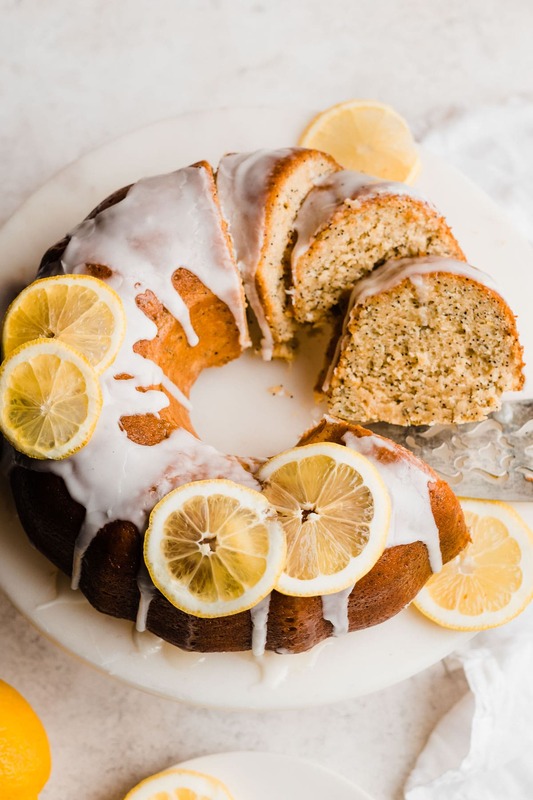 For a last, sunny kiss, give the Lemon Poppy Seed Cake a generous drizzle of creamy lemon glaze. I don’t think I need to tell you that everything about this is a good idea. In addition to seeing this coffee cake whenever I look into the sky, I’m also envisioning it as a beautiful centerpiece to your Easter brunch table, a lazy weekend breakfast treat, and a midnight snack escapade (or three). The most moist and fluffy lemon poppy seed coffee cake you'll ever taste, topped with a creamy lemon glaze. Grease and flour a 10-cup bundt or tube pan. Set aside. In the bowl of a standing mixer fitted with the paddle attachment or a large mixing bowl, combine the whole wheat pastry flour, yeast, sugar, and salt. In a microwave-safe bowl or saucepan, heat the milk and butter to the temperature specified by the yeast manufacturer (120 to 130 degrees for Red Star Platinum Instant Yeast). Stir the liquid together well before taking the temperature, and for best results, use a digital read thermometer. The liquid should feel hotter than lukewarm, but not so hot that it is uncomfortable or burns. Add the milk mixture to the flour and beat on medium speed for 2 minutes. Add the eggs, all purpose flour, Greek yogurt, vanilla extract, almond extract, lemon zest, and poppy seeds. Beat on high for 2 minutes. Spread the dough evenly into the prepared pan. Cover and let rise in a warm, draft-free place for 1 hour. Towards the end of the cake's rising time, place a rack in the center of the oven and preheat the oven to 375 degrees F.
Bake the cake for 20 to 25 minutes, until toothpick inserted into the center comes out clean. Remove from the oven and let cool in the pan for 5 minutes, then turn out onto a wire rack. While the cake is baking, make the lemon soak: Place the lemon juice and sugar in a small saucepan. Heat over medium until the sugar dissolves, stirring occasionally. Let stand at room temperature while the cake bakes. Once the cake is turned out of the pan, pour half of the soak all over the outside of the warm cake, let absorb for 30 seconds, then pour the remaining half over. To prepare glaze, whisk together the powdered sugar, lemon juice and milk in a small bowl, until smooth. Drizzle glaze over cake and serve. I’m sharing this post in partnership with Red Star Yeast. Thanks for supporting the brands and companies that make it possible for me to continue providing quality content to you. For more recipe ideas and inspiration, check out Red Star Yeast on Facebook and Pinterest too! I’d rather see fluffy lemon cake than clouds! And I love the texture. It’s cool to have a bread/cake hybrid! It’s like a new mashup! This cake is so beautiful! Forget putting flowers in a vase on my kitchen table…I just want to put this cake on a stand in the center of my table for decoration! Gawwwwwl what a gorgeous bundt!!! I love the idea of a fluffy yeasted bundt cake and I could see my family devouring this thing at Easter brunch! In other news, did you ever see My Big Fat Greek Wedding? Now whenever I see bundt cakes, I’m reminded of the part where Tula’s mom tries to pronounce “bundt” Such a knee-slapper, ha! Have a great weekend, dear! Hey girl-That looks amazing!! Crazy good!! Oh lawd, that fluffy cake i s outta sight! Lemon always reminds me of spring and I know you are probably ready for spring as much as I am (especially after this WI winter!). I think this is totally dessert for breakfast material! Next time I look up at the clouds, I will be seeing this absolutely gorgeous cake too girl. My mouth is watering for this cake, Erin! It looks so good. You can never go wrong with a classic lemon and poppy seed cake. You have baked this to perfection Erin! This looks so light and airy! It reminds me off a marble cake recipe I have, too sweet to be a bread but not overly sweet to the point of being a true cake. This is good though because that means I can allow myself to have it for breakfast! What a beautiful springtime cake! I am loving all things lemon and citrus right now! And I really like that this has the yeast in it! Have a great weekend!! Hi Ana! Great question. It’s .25 ounces or a scant 2 1/4 teaspoons. I hope you love it! This cake looks absolutely gorgeous! The best way to start off spring! Love. Lemon and poppy seed.. definitely one of the best combinations :D Looks really fluffy and yummy! Gorgeous cake! I can see why that’s all you’re seeing in the clouds. ;) I love that you used whole wheat flour too – I’ve been using it so long in baked goods that when I have something with AP, it often tastes to me like it’s missing something. That lemon cake is beautiful! That looks like the perfect thing for Easter brunch! This is such a beautiful cake! I love lemon desserts and adding yeast is such a great idea to make it airy and light! With the lemony glaze, this looks like the perfect cake for spring! This looks like heaven!! I am a huge lemon poppyseed bread fan, but I have never seen a recipe like this that uses yeast. I’m so intrigued! I definitely am going to give this a try. Anything that I can eat for breakfast and dessert is a winner in my book. And so pretty too! I think I like the word “cloud” better than “cake” ;) Whichever word you want to use, though, this looks delicious! 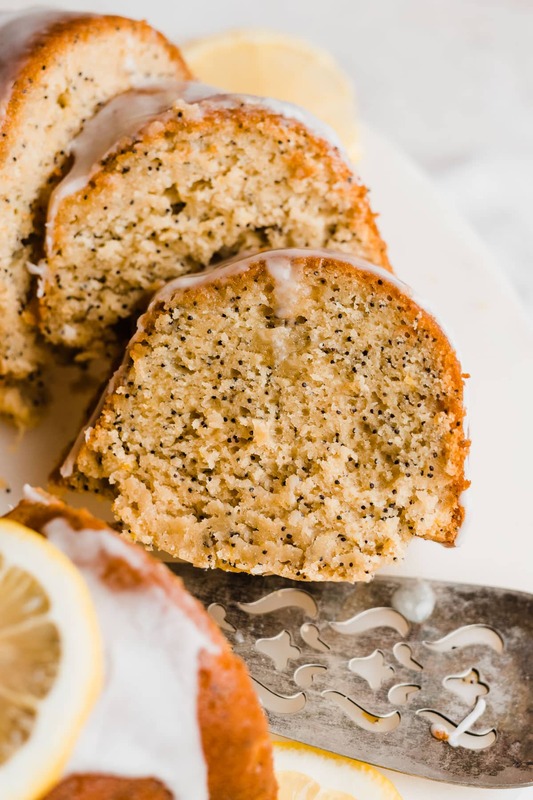 Lemon poppy seed cake is probably one of my favourites ever! It’s always so incredibly moist, and I just love the citrusy sweet flavours. So so yummy!! I would like to FACE PLANT into this deliciousssssssss cake! Could I make this with all Whole wheat pastry flour!? Should I add vital wheat gluten if I do? Excited to try!! Hi Becca! You can swap all purpose flour instead, then omit the vital wheat gluten. I hope you love it! I’m making this now, anyone know how much the cake is supposed to rise before putting in the oven? It’s been an hour but it hasn’t doubled in volume like a bread would. Should I wait a bit longer, or just plop it in the oven? Hi Leah, it’s been quite a white since I baked the cake, so I can’t remember an exact amount that it rises. It doesn’t need to completely double in size like bread, but there should be a noticeable difference. If you used whole wheat flour, that can often take up to 2 hours. I realize you will have baked it by now, so I’d love to know how it came out! There are many comments about this cake but very few actual reviews which is a shame because it’s delicious and very quick to make. The crumb is moist and fluffy as described. My cake looks identical to the one pictured with the recipe, both inside and out. It’s a different texture from a traditional poppy seed cake made without yeast but I like that it’s lower in fat and sugar. The only deviations I made to the recipe were to sub all-purpose flour for the whole wheat pastry flour, and I used Balkan style yogurt instead of Greek. I let the dough rise in the pan for 75 minutes and it more than doubled. The cake had great oven spring and rose almost flush with the top of my large bundt pan. It deflated a bit as it cooled. It was done in 20 minutes. I brushed the top (which became the bottom) twice with the lemon soak before removing it from the pan and instead of pouring the soak over the outside of the cake I brushed it on gradually so that none of it ran off. The outside crust with the soak and the drizzle is delicious and very lemony. It’s the best part! Sadie, I am so glad you enjoyed the cake, and I so appreciate your taking the time to leave this wonderful review! Your tip about brushing the cake instead of pouring is a great one.